The Galapagos Islands are a territory of Ecuador. Its flag is a tricolor combination of green, white and blue. 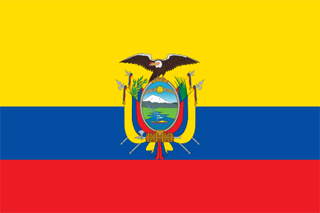 It is believed that the flag was first hoisted for the San Christobal Republic in 1851, on the island of San Christobal, long before the islands become a province in 1973, and subsequently a territory of Ecuador. The shield is quartered. The upper left quarter shows some volcanic cones on an azure sea. This represents the volcanic origin of the islands.